It was a proud and emotional moment for ex-servicemen at the dedication ceremony for the Grangemouth Submariners Association standard flag last week. The event, which took place at Grangemouth British Legion on Friday, was attended by members from branches throughout the area, the Royal Naval Association and Falkirk Provost Pat Reid. Raymond Burns, association treasurer, was present to help members officially raise the new flag - which will allow the branch to march alongside other service organisations at national events. He said: “We have been going for around a year-and-a-half and now we have raised our standard - our official flag - we will be able to parade it during Remembrance Sunday, Armistice Day and at the funerals of submariners. Raymond said the commitment of fellow submariner John ‘Tex’ Ranger, who is seriously ill at the moment, was one of the main reasons the branch got up and running in the first place. 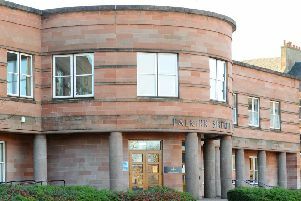 He also thanked Falkirk Council for its kind donation to the cause. The Grangemouth Submariners Association, based at Grangemouth British Legion, meets monthly to help and support those who have served or who are currently serving in Royal Navy submarines. Officially part of the Submariners Association, the branch follows the ethos of the national body, seeking to maintain the special bonds of friendship, loyalty and comradeship, together with a pride in the Submarine Service, formed during service in Her Majesty’s submarines.